Our Gift Planning team has experience across a range of giving opportunities, and we are always available for phone calls and personal visits to discuss your particular areas of interest, from designating Westmont in your wills or trusts to exploring life income gifts with generous tax benefits. We offer supplemental estate planning and tax guidance information on these web pages through our planned giving partner, Crescendo Interactive, Inc. Based in Camarillo, CA, Crescendo has been a preferred service provider for over 30 years among colleges, universities, faith organizations, professional advisors and other nonprofit organizations. For 47 years, Jim Fisher has advised businesses, organizations and individuals about financial planning through his firm, Trinity Financial Partners. "Applying charitable tools through estate planning can be the most efficient and effective way to help people support what they believe in," he says. 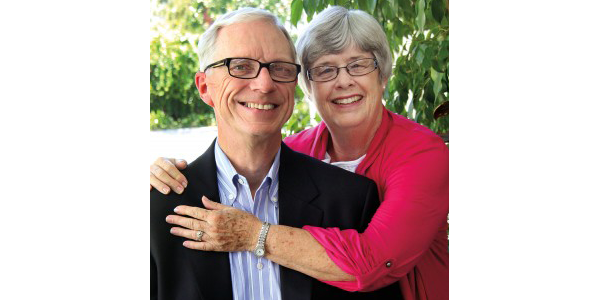 In their own estate, Jim and his wife, Marcia, have made a provision for Westmont, the college their three children attended. "Sending all three kids to Westmont was the best decision we ever made," Marcia says. "The influence professors had on our children have lasted a lifetime - they got to our kids' hearts. They all had so much fun and learned so much, especially how to live life." "We've seen how the Lord multiplies the remarkable educational disciplines that take place at Westmont," Jim says. "It's a joy to support an organization seeking after the Lord, growing the Kingdom of God and multiplying his grace in the world." Mike '89 owns Fisher Computer Consulting and resides with his wife, Melissa Roth Fisher '90, vice president of credit for Strada Capital Corp., in Rancho Cucamonga, Calif., with their two children. Fred '92 and Kathryn Dorchak '95 Fisher live in Santa Barbara. Fred founded Trinity Capital Management, a sister company to his father's. Katie is a physical therapist who stays home to care for their two children. Lynne Fisher Asfahl '94 was completing a doctorate in psychology, awarded honorarily, before she died from cancer in 2011. Her teenage daughter, Perrin, lives with Jim and Marcia. "The spiritual training our children received is just as important as the intellectual," Marcia says. The Fishers have a long history of servant leadership in couples ministry, Bible Study Fellowship and Crown Financial. Their sons and their wives are also involved in ministry. Mike and Melissa work with junior and senior high youth groups, and Fred and Katie volunteer for Young Life. "Westmont equips students with the tools they need to meet all the real challenges of life," Jim says. Reproduced and adapted with permission from the fall 2014 issue of the Westmont College Magazine. For more information about how to include the college in your estate plan, please contact the Office of Gift Planning at (805) 565-6058 or giftplanning@westmont.edu. Learn how our supporters have made an impact through their acts of giving to Westmont. Be inspired by the various ways of giving used by our alumni, parents and friends.